Mario and Luigi take Peach on a vacation to Yoshi's Island in Dinosaur World. However, when the princess goes missing the brothers discover Bowser had crashlanded his airship here and is now causing trouble once again. As well as the new Feather item that gives Mario a cape, allowing him to glide through the air and spin attack enemies, you can also find Yoshi, a friendly dinosaur Mario rides who can chow down enemies with his sticky tongue. As you clear stages you can access new areas on the world map. Finding secret exits will open up even more pathways and shortcuts through the game. 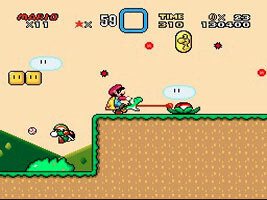 Can you defeat Bowser and the Koopa Kids and find all 96 Goals? Yoshi appears to have been based at least partly on Tamagon, the dragon hero of Devil World (NES 1984). Both are green dragons with red feed and head crests. They both have the ability to blow fire after collecting an item, and Yoshi can sprout wings much like Tamagon. Tamagon's name means "egg dragon", and both he and Yoshi make exactly the same sound effect when hatching from their eggs. After clearing the Star Road levels, you open up the SPECIAL World. If you wait on the map screen long enough for the music to loop a few times, it changes into a remix of the Super Mario Bros. theme.